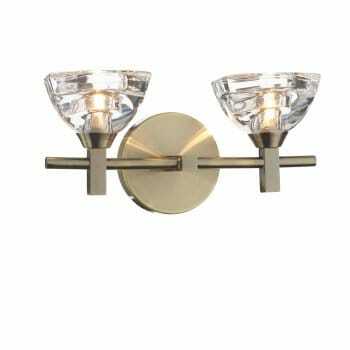 Dar Lighting Axle 2 light switched wall fitting features an antique brass finish with centrally mounted straight arms supporting clear glass shades. The product code for this Dar wall fitting is AXL0975. A stylish design which will sit well in both modern or traditional styled decors within your home and provides bright halogen illumination. This fitting is double insulated and comes complete with a pull cord switch. The Dar Axle family of lights also includes a 6 light ceiling fitting and a 4 light ceiling fitting which can be viewed on our website.